Living as we do in a materialistic age, it’s difficult to conceive of what the world was like before the invention of money. There was indeed such a time, but it ended half a millennium B.C. in an ancient town an hour’s drive east of Izmir. The town is Sardis, one-time capital of Lydia, ruled by King Croesus (560-546 B.C.) who, it is said, thought up the idea of hammering little discs of precious metal with his portrait, and using these discs (coins) as an intermediary means for the bartering of goods. Croesus must have liked his invention, for the phrase “rich as Croesus” rings in our language to this day. Croesus, for all his wealth, didn’t last that long (though his invention did). The Persians swept into Lydia and put an end to his reign, and also ruined his capital (no pun intended). By the 3rd century B.C. Alexander the Great had come through and conquered Lydia. After him an earthquake brought much of Sardis down, but it was too important a city to die, and when the Romans arrived they began to build it up again. 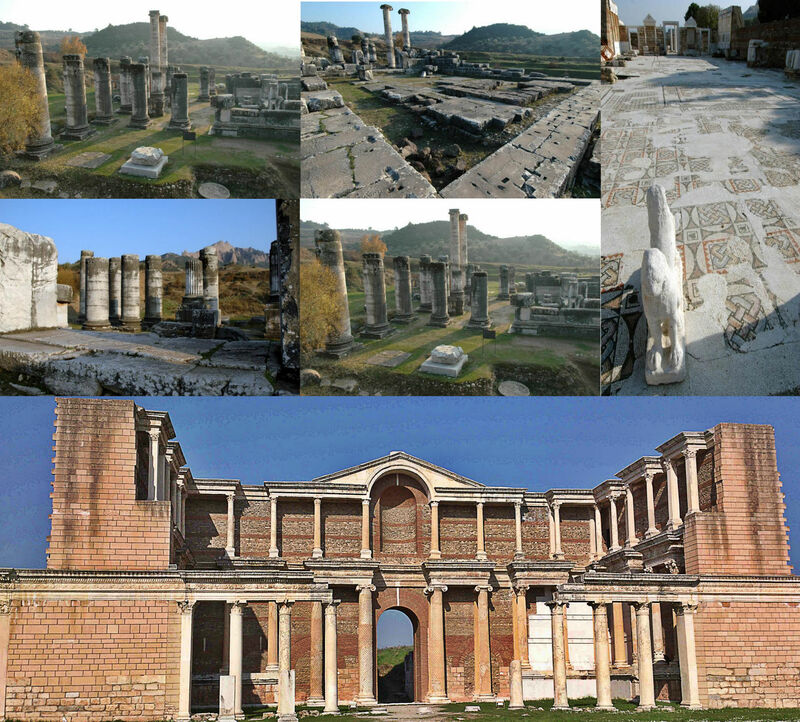 Most of the ruined buildings you see at Sardis today date from Roman times. If you go to Sardis in high summer, start out early so that you can tour the ruins before the sun becomes too hot. There’s a good deal of walking to do here. There are two small Turkish villages near ancient Sardis, surrounded by vineyards, olive trees, and fields of melons and tobacco. The one you want is Sartmustafa, right on the highway. The tea houses on the highway in Sartmustafa are where you wait to catch a bus back to Izmir once you’ve finished seeing the sights. The other village, Sartmahmut, is about halfa mile north of the highway, at the train station. GETTING THERE: Sardis iş 56 miles (90 km) east of Izmir along the highway to Ankara. Travel agencies in Izmir run full-day tours to Sardis, including a stop in the nearby city of Manisa, for about $25 per person, lunch included. Contact any travel agent for details. You can do the trip yourself with a bit more trouble, but at a fraction of the price of a tour. Buses to Salihli, the next big town east of the ruins, depart frequently from Izmir’s Otobus Garajı. The trip to Sardis takes about 1 hours and costs 20 TL. Tell the ticket seller and the bus driver that you want to get off at Sart. TOURING THE RUINS: The ruins of Sardis are mostly at two different sites. The first site is a short stroll east of Sartmustafa along the highway; the other is two-thirds of a mile south of Sartmustafa along a village road. Start with the site east of the village, which is the most extensive part of the ruins. It’s open from early morning till dusk; a ticket costs 8,00TL, half price on Sunday and holidays. You must pay an equivalent fee at the other site also. After buying your ticket, you enter the ruins along the Marble Way, lined with Byzantine-era shops. Note the water and sewer pipes buried in the stone walls. Signs on the shops identify their purposes, and even sometimes their owners. At the eastern end of the Marble Way, rum left and enter the synagogue, which is large and beautifully decorated with mosaic paving and artfully cut colored-stone panels. Excavation and restoration (1965-1973) of the synagogue was supported by the Sardis American Excavation Fund, and a plaque within the structure lists names of donors to the fund. South of the synagogue is the impressive facade of the great gymnasium, in this case a combination school and athletic facility. Behind the facade is an oval swimming pool. At the other site, south of the village, is the Temple of Artemis, Sardis’s most famous building. Take the road beside the tea house and walk for ten minutes to reach the temple. The great temple is now in ruins, and in fact it was never, in its long history, ever completely whole. It just never got finished. Now only two of its tall columns remain standing, but they give a fertile imagination the idea of what the magnificent structure must have looked like in its prime. Next to the temple is an altar which was here even before the temple was built. Alexander the Great, and later the Romans, used it for religious ceremonies. At the temple’s eastern end is a small brick Byzantine chapel. All this site needs is a little mosque to continue the tradition and it will have been sacred to man and divinity since earliest times.